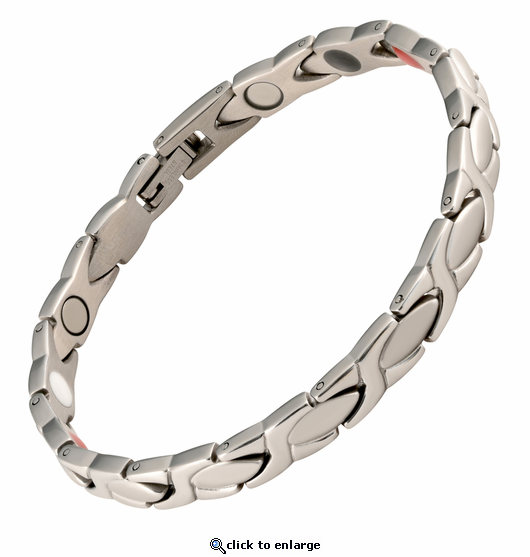 This is a cutting edge stainless steel magnetic therapy bracelet. It has matte silver O centers with shiny silver X accents and is about 1/4" wide. This is a new cutting edge therapy bracelet that has 4 wonderful things going for it, so we call it 4 in 1. This style has the following 1) 3300 gauss bio north facing magnets(silver), 2) Germanium(Black), 3) , Far Infrared Ray technology(Red), and 4) Negative Ion technology(white). We hope you will enjoy this wonderful bracelet that combines 4 technologies that are believed by many to help our bodies naturally in many different ways. The information below is designed for educational purposes only and is not intended to be a substitute for informed medical advice or care. We make no overt or implied claims for effectiveness, health, cure, treatment, or mitigation of any condition. Far Infrared Ray is believed by many to help the body detoxify and maintain vitality. Negative Ions are believed to promote better metabolism and balance in the body. It is believed that they may improve the body's functioning in many ways including the immune, cardiovascular, muscular, and circulatory systems. Germanium is believed to help in many ways including the immune and circulatory systems. Many believe it may also help with fatigue, improving sleep, detoxify the body, and pain conditions. Neodymium magnets are believed by many to help in many ways including circulation and reducing inflammation and pain conditions. Order yours today. The bracelet was a gift for my sister who has arthritis in her hand. She likes the looks and also helps her overcome the pain. Very nice bracelet. Item looks good however has done nothing for my pain or anything at all. Nice if you want an inexpensive bracelet. Merchant's comment: Are you wearing most of the time? Have you read the instructions we have included? We are glad to help if you contact us directly. Im very happy with my bracelet . Thank you so much for fixing it to my right size. I was skeptical this would help my aching joints. The cost was reasonable so I was willing to try. I am glad I did. I don't know how it works, but it does. You will not be able to find another company that is so customer friendly. I returned to buy additional pieces and have recommended this to my friends. I tried this bracelet because I type all day and have the start of arthritis and my wrists would swell. I have been on meds, to an orthopedic, tested for carpal tunnel syndrome and to therapy and nothing worked....until I put this bracelet on. OMG! I can now type without the pain. I dont have to sit on my hands anymore to relieve the pain. I love it and am buying one for my parents and husband. I may end up buying an anklet for my plantar fasciitis, knees and back. Thank you! !And customer service is AWESOME! And you can't beat these prices. Thank you again for making these and making them affordable for people.! Great products why better quality then I was expecting . I bought this after recommendation from other reviewers. I think omit has helped my achy hand i it seems to help me sleep better too! I also have an anklet and two pairs of insoles. This bracelet is very lovely. Looks more expensive than what it cost. The fit is perfect. It came in 5 business days. I learned about the site from a family member who was very satisfied with her purchases. Need to look over the copper bracelets next. This bracelet looks like fine jewelry. It helps with the arthritis in my shoulder. I put it on and have not taken it off. It stays just as shiney shower after shower. Very comfortable, and I am feeling the benefits in my hand joints within days. I love this bracelet!! It has helped my aching hands, and I wear it all the time!! Stainless steel is the way to go because you can wear it in water. Looks great too! I love this bracelet - it's both beautiful and therapeutic! This is my 4th bracelet ordered from this site and I've never been disappointed with quality or customer service. When I received the 1st Silver XOXO 4 in 1 bracelet, the clasp was very difficult to open. I contacted customer service via email and they sent me a brand new bracelet and a self addressed, postage paid envelope to return the 1st one. Excellent customer service in my opinion and 2nd bracelet was perfect! I am more than satisfied with my purchase of the XOXO 4 in 1. The picture on the site doesn't do it justice....it's beautiful. My bracelet arrived on time and fit perfectly. I was looking for a new magnetic bracelet and came across this site, I loved the fact that the bracelet would arrive ready to fit my wrist (not having to take links out) and my aches and pains in my hands are once again gone. I will not hesitate to purchase an ankle bracelet when I'm ready. TWO THUMBS UP Magnet Jewelry Store!!!! I am thoroughly satisfied with all 4 products - we had a particularly intense project that had to be finished and I bought each of my co-workers a bracelet to thank them for working so hard. I have been wearing magnet bracelets for years and thought this would be the perfect gift to thank them for all their hard work.